Well here we are! The sun was shining today and I was able to get out in the garden and take these pictures of our 1952 Vintage Holivan….now we have given it a make-over! If you remember, the whole inside had been stripped out apart from a make shift bed, but this is what appealed to us in the first place! Well apart from the fact that the caravan was so damn cute! We started by painting the whole inside white…you know me! I love a white background….to me it is like a canvas and then we decorate with the colours that we love! which is mainly primary! We have found it really easy to decorate, as most of the items you see in it, is from our other house! Remember we downsized last year…well there was quite a few items that I just couldn’t bare to part with and it has really helped with the decor. 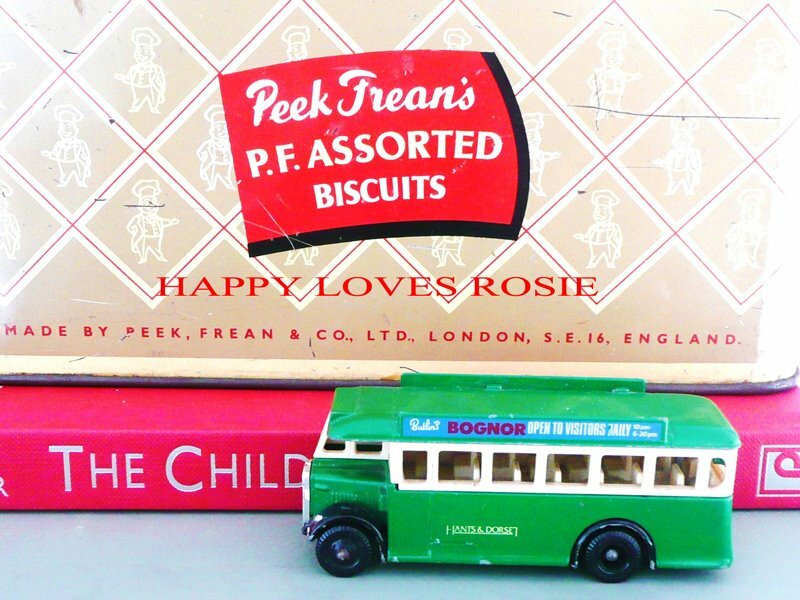 Off course there a few pieces that you will recognise from previous flea markets that we have visited too! Earlier today, after taking the pictures, I took my computer in there (oh yes we have electricity!) and started editing them….It felt wonderful and after a time, I curled up on the bed and went fast to sleep! 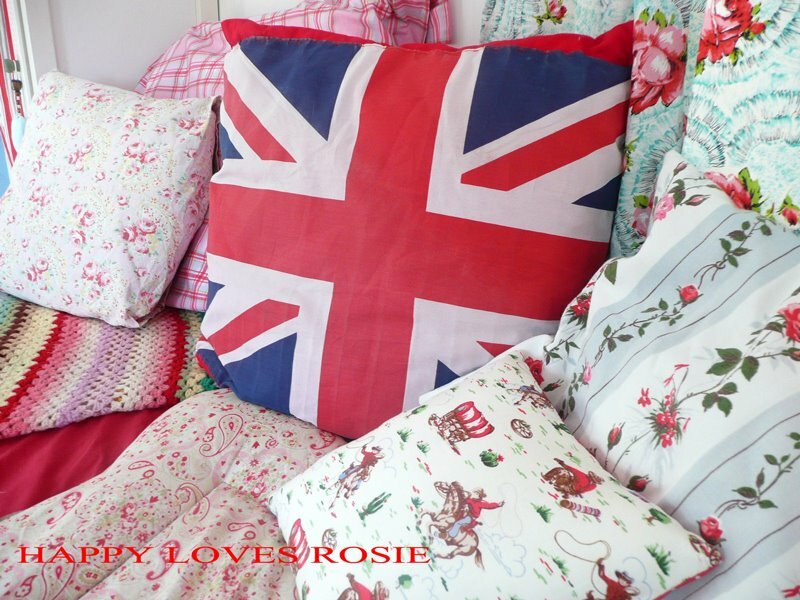 Can you see here we have used vintage fabrics as well as new ones and of course our signature union Jack…Big up Blighty! LOL! 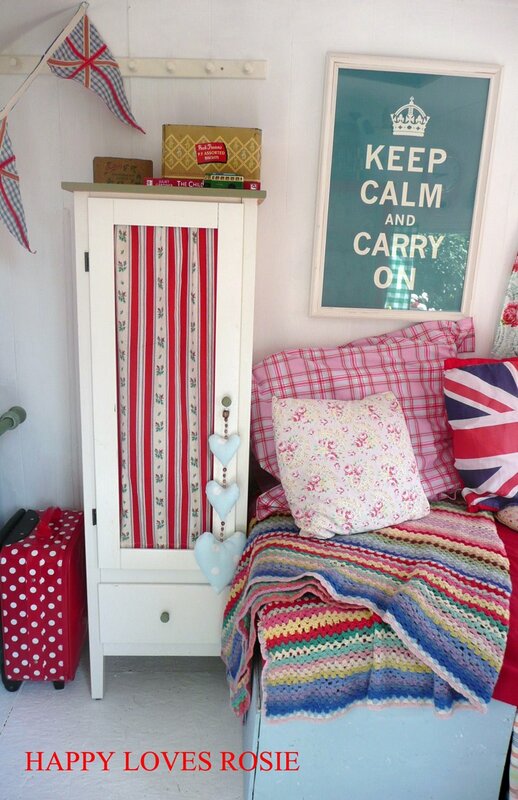 Here we have a little Ikea bathroom cabinet bought at a Booty a couple of weeks ago for £10.00 and decorated with 1950’s vintage material and hearts that I bought at a Booty in Somerset…this will soon be full of crafting materials, as its so apt for the job! Our little Holi is full of whimsy and vintage charm…its full of things that brings smiles to our faces, bits and pieces from both our pasts, that we cannot bare to be without…! And look who is making himself right at home! How much is that doggy in the window! Since this article was written over 3 years ago now, Our Holivan has been the inspiration for many many guys and gals buying and decorating their own individual vans, for holidaying or for creative spaces in their own gardens…you could call it Caravan Fever! So please do take a look HERE and HERE on Holi’s progress…she really is a gem and quite famous now….Last year we bought her a big brother….this time a vintage 1960’s Cheltenham…when the rain stops…I am going to give him a makeover too!…but he is so full of character, I kinda like it the way it is and for now it is a daytime space for my son…anyway, we’ll see…as I said, when the rain goes away I might give him a little makeover too….but when my son moves out… I will be having it as my own little crafting sanctuary…BLISS! Oh and suggestions please on how to get rid of grown up adult children…that should really be married by now and have a place of their own!!! lol! D Y I N G here . . . Oh my goodness! Cutest thing EVER!!! This looks like the cosiest living space ever! I absolutely adore it! Really awesome post. You have some really neat items. Oh wow, this is awesome! OMG! That is sooo cool! What a wonderful retreat! 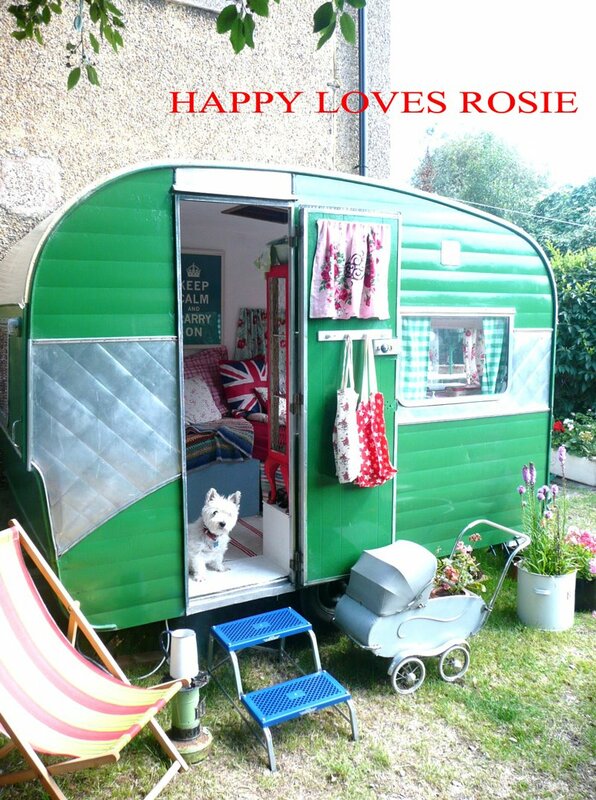 Love your caravan, I dream of having my own one day to work in! I love your caravan!!! Its amazing so cute!!!! AMAZING! I don't know what else there is to say 🙂 Thank you so much for sharing! I LOVE the canisters in the pic with the Gnome. Are the purchased or handmade? Oh I want some for my vintage trailer. Oh my word…. That caravan is AMAZING!!!! Now I want one. I love your blog so much and especially the sweet green mobile home.I wanted to let you know that I featured your caravan on my blog ( http://www.maiadream.blogspot.com/ ). I hope you don't mind?Have a great day! I love this. I just bought a camper trailer and was looking for ideas. This rocks! I put your address on my blog. Oh my goodness, I just came across your blog, I love all of it. The patterns, colors! Awesome! AND! so is your precious caravan. I SO WANT ONE! 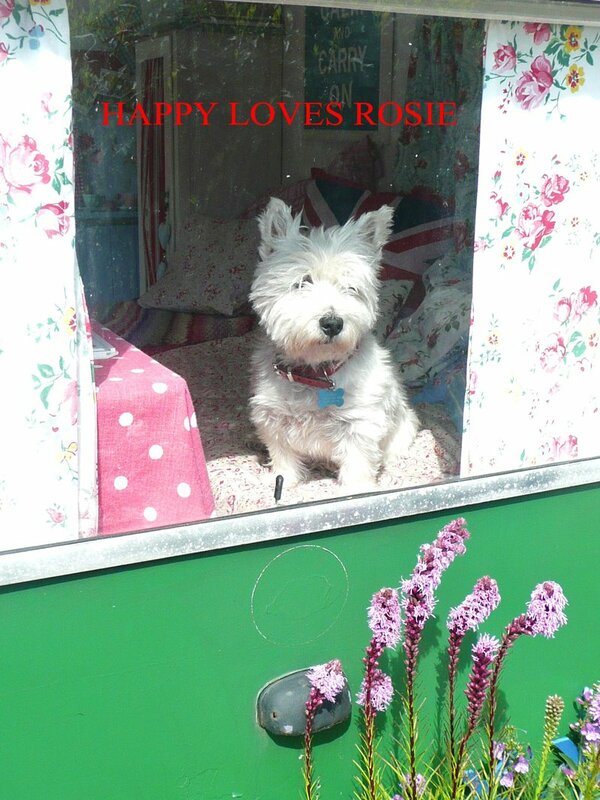 Happy times are yet to be had in your darling caravan. i want a caravan just like yours. how great is that! Do i like this post? No!!! I LOVE IT!!! I will be back and take the afternoon off to read more. All the best I have become a follower. Love how your stories pop and the colours jump right off your page. I have wanted a vintage trailer for FOREVER! If I had one, I would decorate it just like yours. 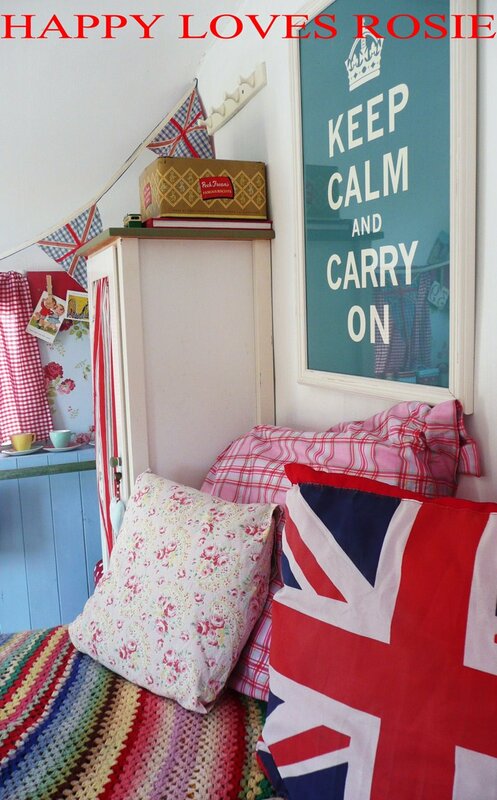 I love love love the interior photos with the "Keep Calm and Carry On" poster and all your Union Jack goodies! 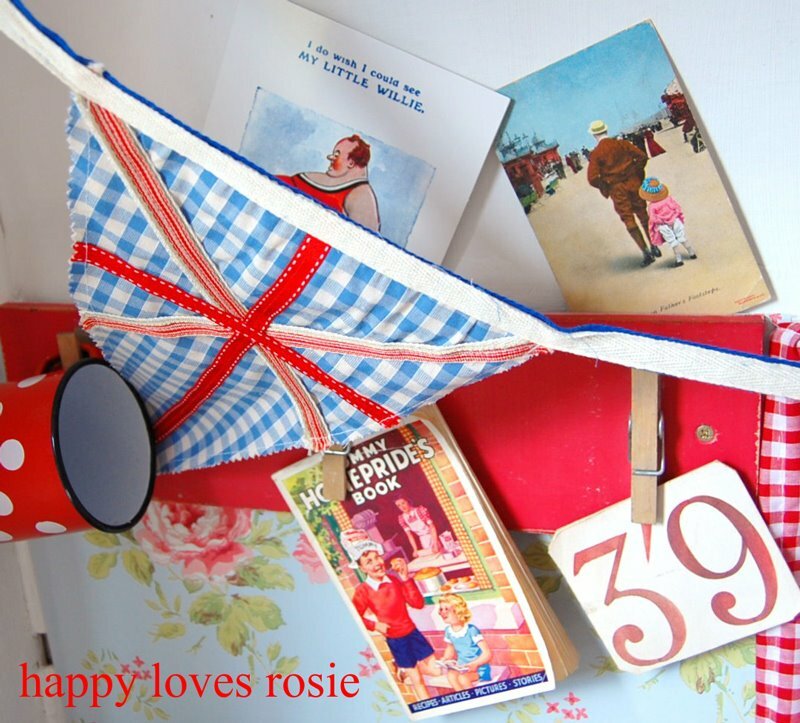 I am American, but am fascinated with you Brits and your Union Jack, and utterly adore all Cath Kidston! OMGoodness! I really love the caravan, I want one! I think I am turning green with envy. I love what you have done with the inside too. What a haven, I hope you have many, many, happy hours there. i LOVE LOVE LOVE LOVE LOVE this little thing that you have created! i would just die of happiness if i had one of these set up in my back yard to escape to. amazing. Amazing how incredible well you made it look!Compliments! I LOVE IT!!!!! How cool would it be to have a whole caravan of these going down the road to an art retreat!! I can't wait to show my hubby what I want next, hahaha. Well done! That is the cutest caravan I have ever seen. 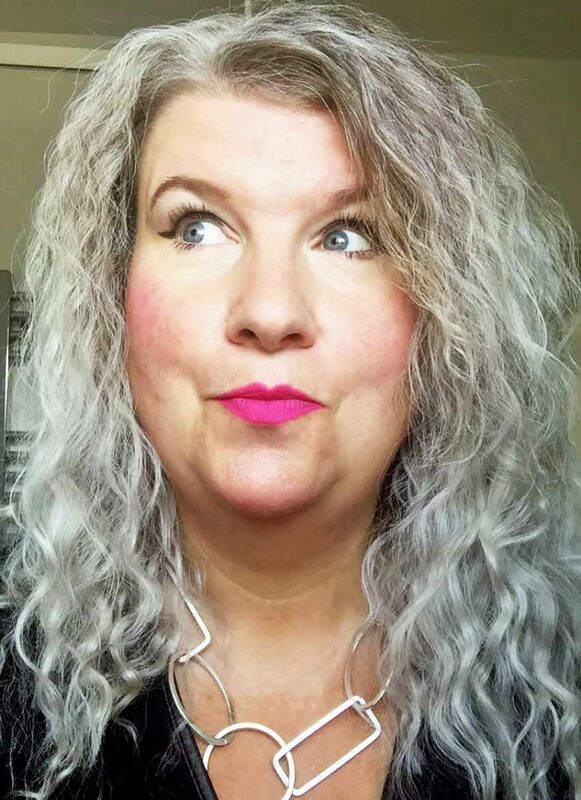 Just discovered you today but I love, love, love your style so I'm going to check out some older posts. Hoping you have a sunny day! 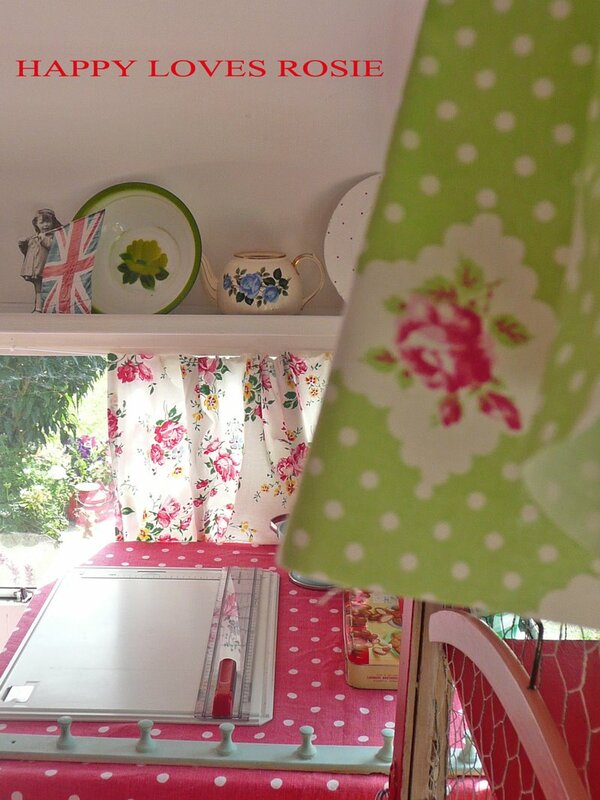 Hi.Congratulations on your vintage caravan, so beautiful specially the vintage fabrics you have. Its kind of a little home with a small garden outside, so perfect! When can I move in?? 😉 Oh, how I love your little camper. My sister in law has one that she's re-done in a similar way and, ever since, it's been my dream to do this too. Lovely! Sweet! THat is the cutest darn thing ever! I adore it. I used to have a vintage VW bus that I decorated in the Gypsy style…I plan on getting another one! You are inspiring moi !!!! I loved your vintage trailer. It is so cute! Also keep up the good work on your blog…I love reading it! 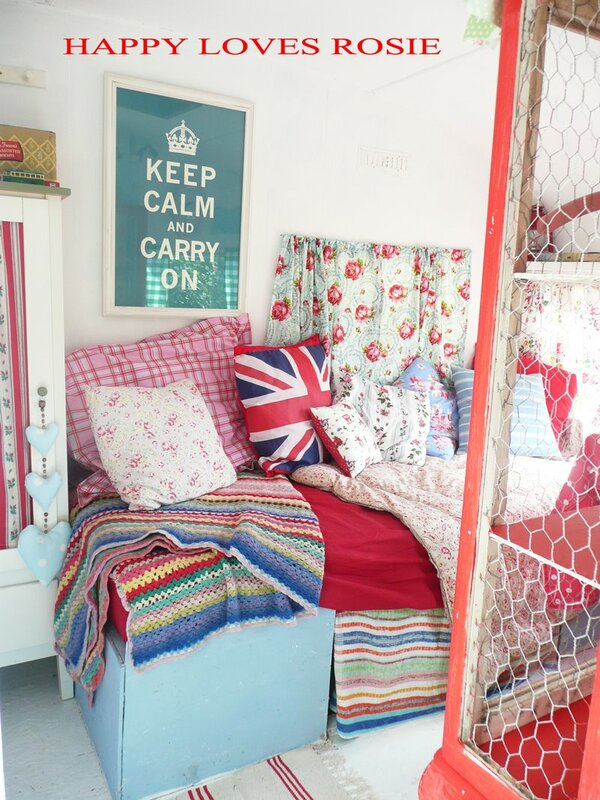 I love it, what a cute space. I just bought the Blogging for Bliss book this weekend and found your blog in there. Congrats on being featured:) Now I'm off to look around some more. Hello! I just recently found you pretty little blog from the book I just bought: Blogging for Bliss. I just wanted to stop by and say hello. Your an incredibly talented person… There is so much eye candy on your blog I love it! 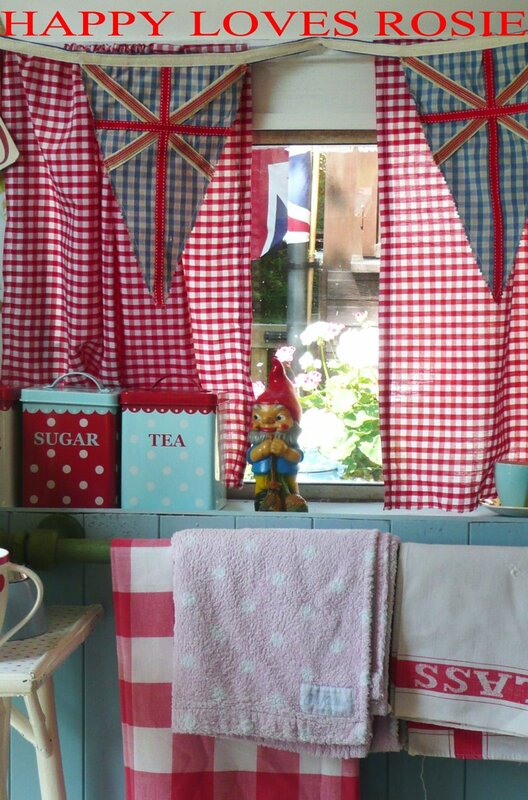 How ADORABLE and totally VINTAGELICIOUS is your camper! The decor, the fabrics, the colors are "to-die-for"! 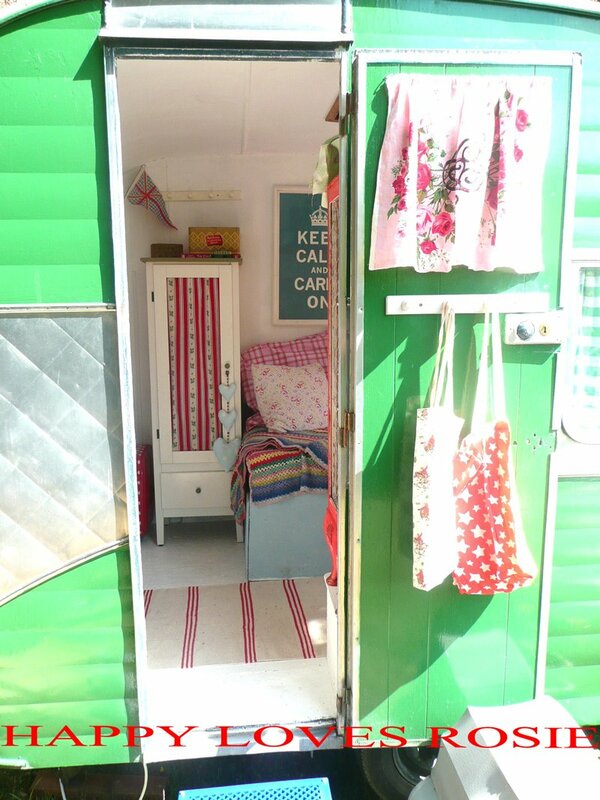 Can I come and live in your lovely camper?! Your blog is wonderful and always a treat to my senses! Thank you for sharing! What a "pick me up" to be able to escape to such an inspiring place! It's so pretty. You'll have a great time! Dearest Happy, I once lived in a 5th wheeler and I called it the "Happy Camper". Ah….those were the days! Come on over to my blog when you have a moment…It is called Once Upon a Fairyland. Dedicated to happy times, gnomes, elves and all things that make us smile! I love, love, love your little caravan! So charming and cozy:). 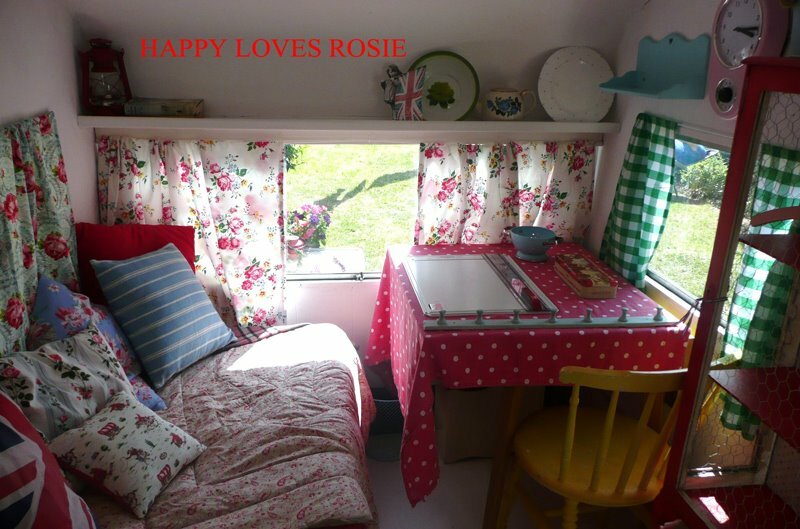 You have inspired me to get on and decorate my little garden summer house.I love your caravan and the colours are sooooo yummy.Do come and visit my blog sometime.Happy days…Bellaboo. 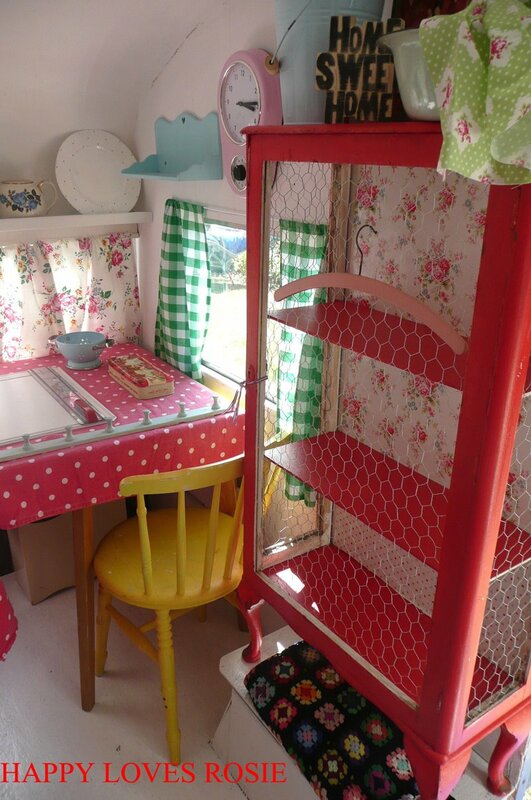 I absolutely adore your camper and the way you have decorated it! Congrats to you. 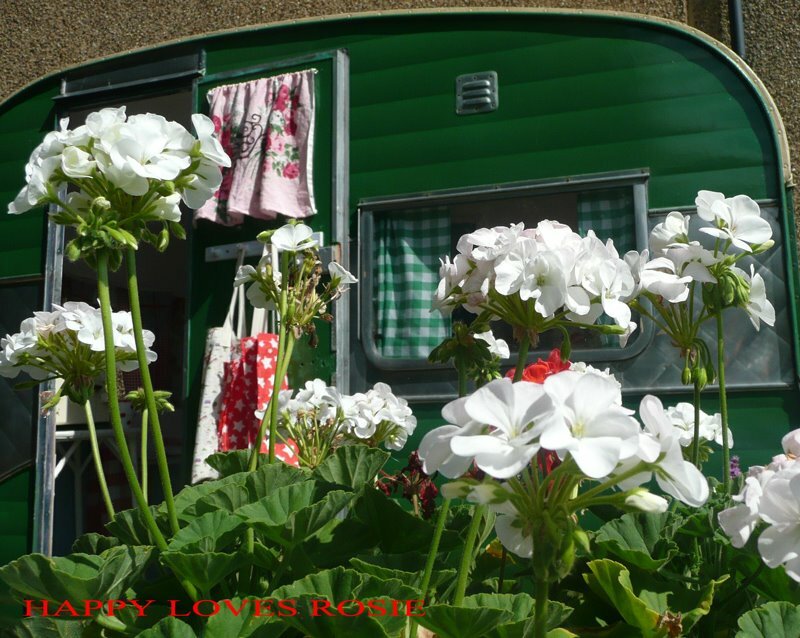 This is my first visit to your blog.I really enjoyed the tour of your Caravan; you have done a great job, and thank you for sharing your lovely pictures.Please come over my blog for a cup of tea. What a fun post. Great photos and a nice tour of a delightful hideaway.Congrats on the Blogging for Bliss profile. I don't know what to say, I'm lost for words! You've done a fantastic job! Really impressive. And you've provided me with the ammunition I need to persuade my husband to have a vintage caravan in the back garden for my office. I've been hankering after one for years. This is wonderful . I found myself more & more jealous as I went through the pictures-haha. Can I come for a stay?Lovely work! Oh wow, it's fab, you are a clever thing! Oh, that is the cutest dang thing…I want to move right in! One of my fave movies is "The Long, Long Trailer" with Lucille Ball and I've always loved those quaint vintage trailers – the smaller the better. Great job! 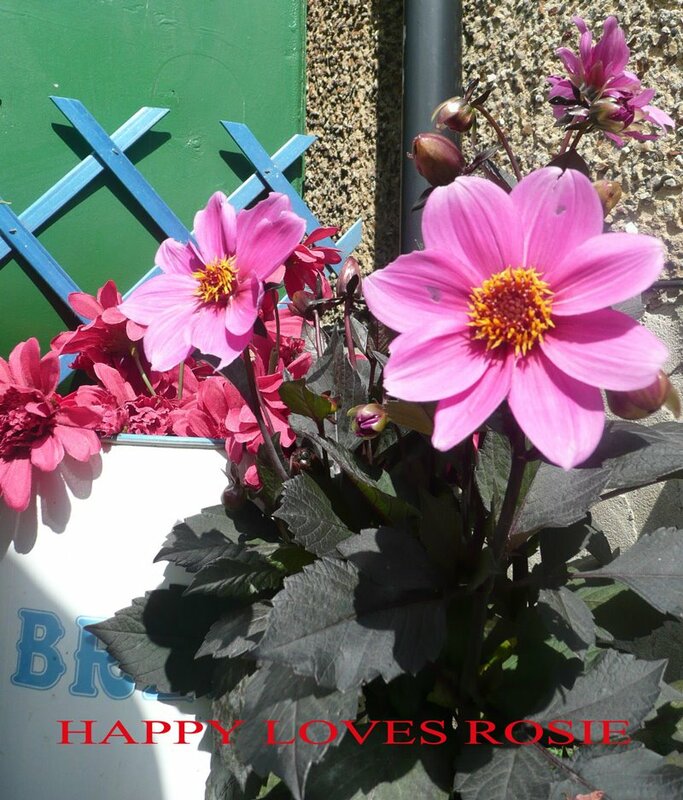 Absolutely love your blog – have only just discovered it. Am now a follower on twitter too! OH MY GOODNESS, HAPPY! This is the most adorable little "canned ham" (that's what we call tiny, vintage campers here in the U.S.) I've ever seen! It's decorated like a dream…red and aqua are my favorite colors…I don't know what your blog looked like before, but it is completely FABulous now! I think I was you in another life…or you were me…or we were we…or…something. Kindred spirits, for sure! Now following your blog, twitter and facebook…woohoo! I LOVE making new friends! Happy, Happy, Happy… I had to hold a mirror up to my mouth to make sure I was still breathing and alive – for certain when I saw you Happy Shabby little caravan/trailer… I thought I died and went to heaven.This is EXACTLY what I dream of having in the little forest beside my house. 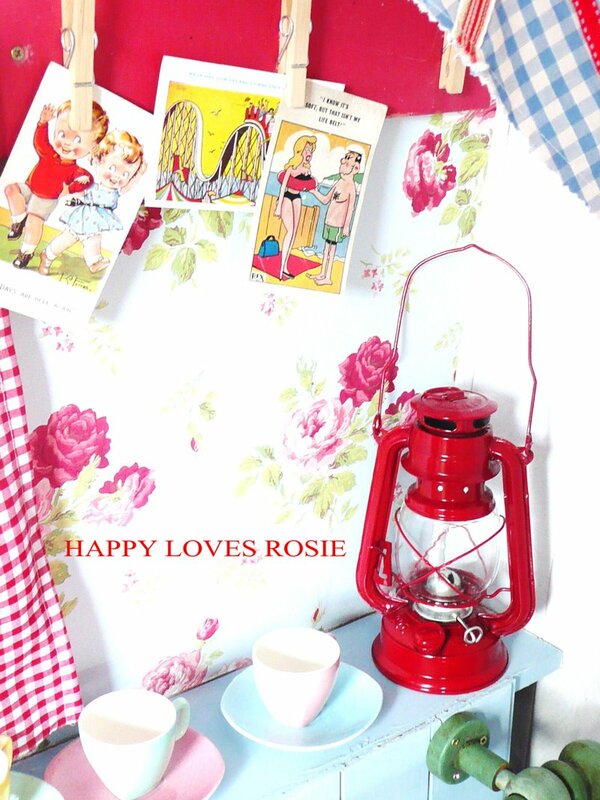 And not just the caravan exactly like yours… but your Happy Shabby deco too. PERFECT. One day I'll have my Happy Shangri-La, and I want it to look JUST. LIKE. YOURS. I need a cigarette. Seriously. I'll be right back… I have to go compose myself. WHAT??? Stop it!! That is the cutest thing ever! Love it , love it , love it ! Let me add my ooohs and ahhhhs! So cute, so fun, so absolutely perfect! Fabulousness! Really cute and much of inspiration! 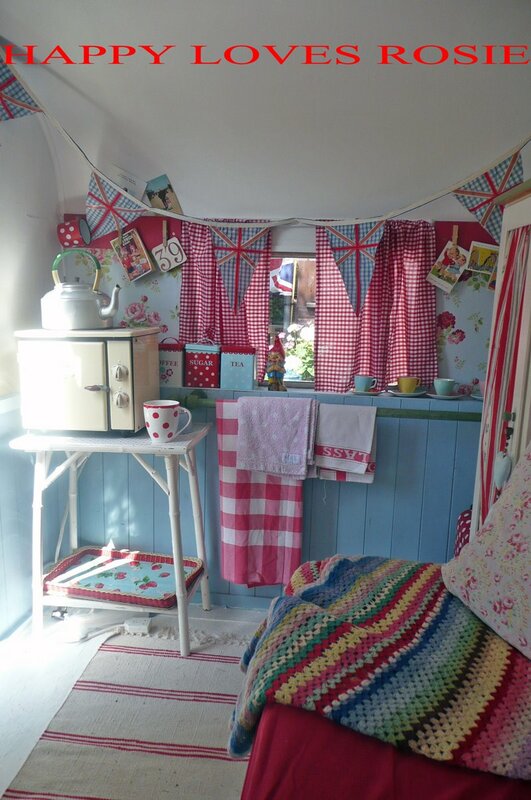 I've wished for a caravan to style my way! Now I see it's not impossible!Looking foreward to more pics! So great! If I win the lottery, I'm going to buy an old caravan and fly you over to New York to make it look just like that! How gorgeous, I am so jealous ! I love everything about it. You must have worked so hard to get it looking so lovely. Let's hope the sun comes out for you tomorrow. Wow that is fab and what a great idea, such a beautiful creative space and very inspiring. Stamps feet, I want one! What a lovely little creative space! Just adorable! That's both cute and practical – what a wonderful new space! I love it!! oh my! I live in Indiana, USA, but don't be surpised if one more you come out to your Jolly Holi and I'm sitting there waiting for you to make me a cuppa. Lovely, pretty, sweet cozy and fuuuuuuunnnnnn!!!! 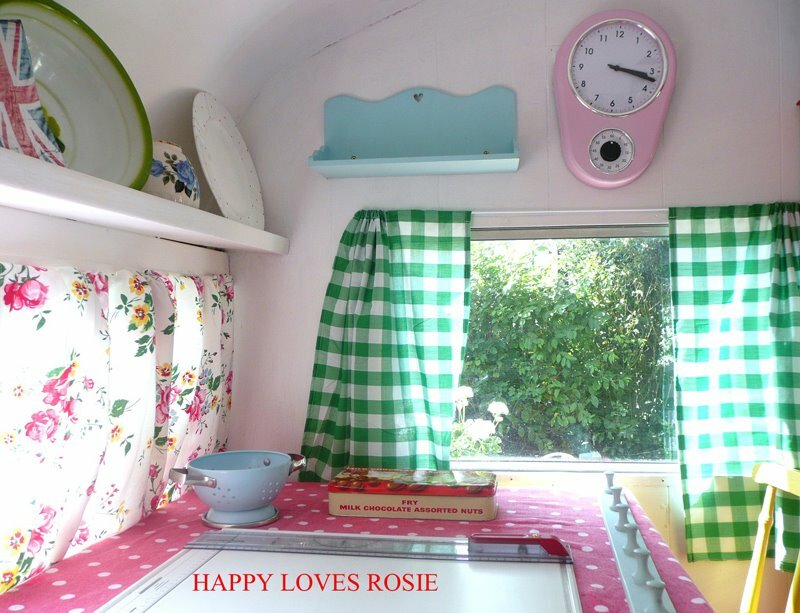 Good morning;)Linked your cutie caravan on my blog, hope its oki that i borrowed a pic;)have a nice saturday.Love. What a creative person you are. It's adorable. Half folly half clubhouse. Oooh, I want to move in!! That is so lovely – can I come and spend a day with you……. Oh, be still my beating heart!I want to run away and move in…it's absolutely perfect!xo, K. Amazing! !I cannot believe how beautiful one small space can be! How peaceful it must be to curl up with a good book and let the breeze blow through.You are surely blessed with this treasure.